I went back and made this a Funny Farm mini-set. 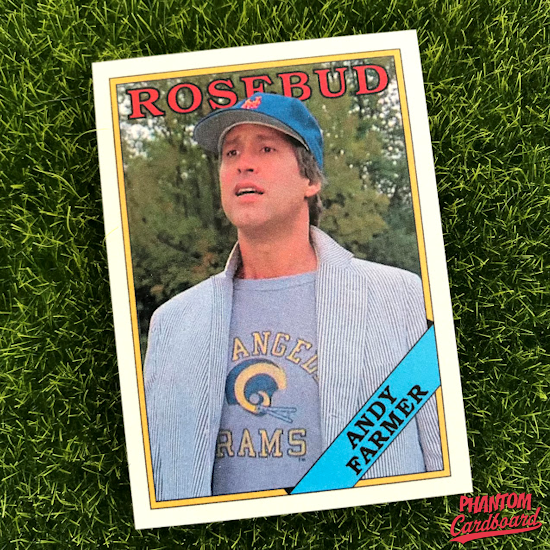 I actually had to correct my original Andy Farmer card because I messed up on the name of the town in the movie. The original said “Rosebud” when it should have been “Redbud”. Oops. I also changed the image because I wanted to use that image for the Record Breaker card. A card, by the way, that I love. An Andy Farmer lamb fry record breaker card is just hilarious to me. I only wish I could have gotten a decent image from that scene, but it’s still hilarious to me. The mini-set rounds out with Elizabeth Farmer. I knew this wouldn’t be one of my larger sets, but I would have maybe added a couple more characters had I been able to find some decent images. 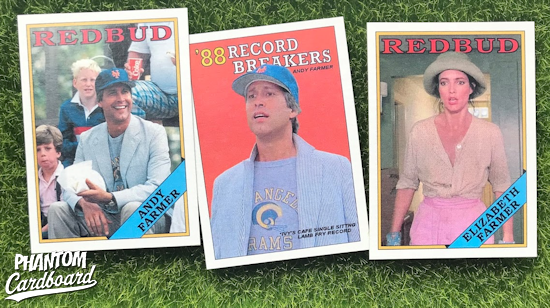 I haven’t made it a goal to make cards of every Chevy Chase role ever, despite that sort of seemingly starting to happen organically. I mean, I definitely like Chevy and am a fan but apparently I need to consider him for my personal Mt. Rushmore of favorite actors. Funny Farm holds a special place for me. It’s a movie both myself and my mom enjoyed. I got my love for a escaping into a good movie from her. She wasn’t a nerd about it like me, but she definitely hobby watched movies. There’s a number of parts I remember her always laughing out loud to. Chevy pulling snake from the pond, the psycho mailman, the “lamb fries" record. I can picture quoting that scene “the trick is you’ve got to clip them off way up high” while making the finger scissor motion. I miss my mom … a lot. Funny Farm is one of those movies that we could always agree on whenever there wasn’t an answer to “what do you feel like watching?” while thumbing through the tapes on the shelf. So this card literally brings a smile to my face to look at, and a lump in my throat if I’m being completely honest. This is the second Andy Farmer card I’ve made. The first one was among the first I made when I started tinkering with card making. It, like the rest, were in the style of the 1985 Topps baseball cards. I wanted to update it to a year accurate template with the movie being released in 1988. My original card was a Mets card with the Andy character wearing a Mets hat throughout the movie. The original picture was really poor quality looking back at it now, this one is much better. I changed it from a Mets card to a “Redbud” card after the name of the small Vermont town that Funny Farm is set in. The gag being that Andy desperately wanting to be a part of his new hometown but the community not receiving him so warmly in return. For the colors I used the St Louis Cardinals scheme from the 1988 Topps because, you know, Cardinals … “Rosebud” "Redbud"… the color red. This card could turn into a mini-set I guess depending on the response I get from it. I’m not sure how many others out there geek out to it like me. It’s not Caddyshack or a Lampoon's classic, but to me it’s up there. If there’s enough others who love this movie as much as I do and would want the other memorable characters on cardboard then I’d be more than happy to expand. If not, I’m cool with this one card being a Funny Farm representation in the Phantom Cardboard raisonné.